We love Barry's gorgeous watercolours bringing out the best of this sensitive medium. He paints complex scenes in different light, capturing atmosphere and moments in time with fantastic skill. 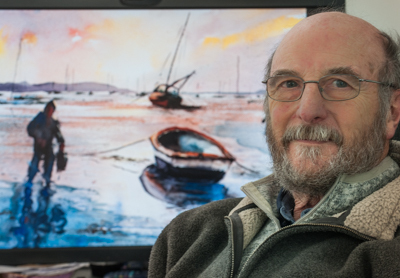 Townscapes, landscapes and seascapes - Barry can paint anything! Each have a distinctive strong composition, fluid brushwork and always harmonious colour. Very impressive and just beautiful. It's not at all surprising to discover that this very modest man was chosen as the SAA (Society of All Artist's) Artist of the Year in 2016. This Year he won the Best Professional Landscape & Woodland Scene. No contest! Inspired by artists such as Alvaro Castignet & Joseph Zubivic, Barry's work always has subtle tones and a beautiful colour palette, sometimes with pops of bright colour singing out, sometimes all of one mood. Barry feels indebted to Steve Hall, local professional artist from Bradford-on-Avon, his friend and mentor for helping improve and develop his work. Barry's lovely paintings have a timeless classic quality, and can be studied, contemplated and enjoyed endlessly. Barry spent many years helping young people as an outreach worker on the streets. He helped set up "Project Millenium Volunteers" in Bath and currently teaches voluntarily for the Carer's Centre in Bath. Such a kind heart as well as exceptional artist! Barry also does demos for art groups, and runs his own classes for a lucky group of enthusiasts. This is a great chance to see a marvellous collection of Barry's work on view in Bath for the first time. His prices are terrific and these paintings bring beauty & grace to any home! Framed in black walnut by the gallery, we feel the wood complements the paintings very well. We hope you agree!